I made some egg cake pops! They’re really cute … But they’re not for Easter. 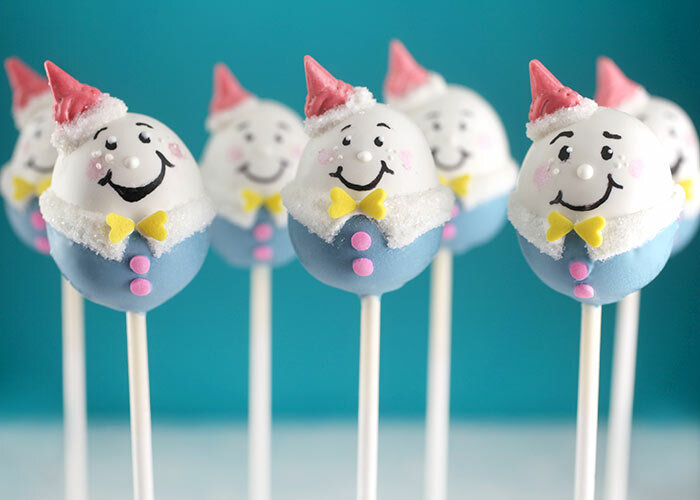 Instead I made happy little Humpty Dumpty Cake Pops for a baby shower that my friend Cupcake Julie threw this weekend. It was an all out Humpty-themed Eggstravaganza. And when I get the pics all together, I’ll show you some of the fun elements she created for it. 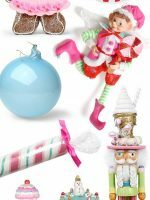 If you remember this Candyland Christmas post of her party decorations, you can probably guess that she doesn’t hold back on the details. But first up… here’s a Humpty How-to. 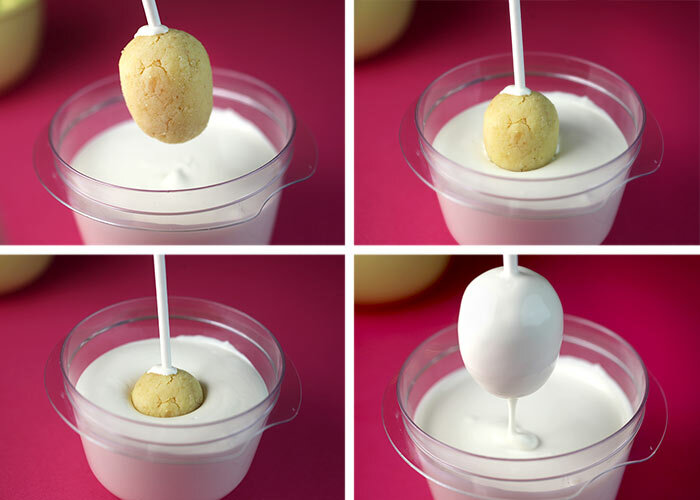 Follow the instructions for making Basic Cake Pops and roll them into egg shapes instead of balls. Try using a piece of wax paper to help shape the balls into eggs. 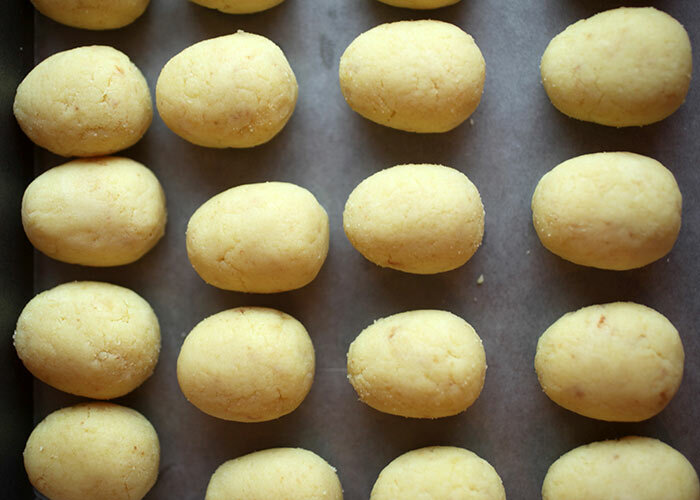 Roll the egg-shapes against the wax paper and it will help smooth out the sides. When they’re all shaped, chill them until firm. Then it’s dipping time. Dip. Dip. Dip. Make sure you have enough melted candy coating in the bowl to completely dip and remove the cake pop without having to stir it in the coating to cover. Eggcellent! … and a blank canvas to decorate Humpty. 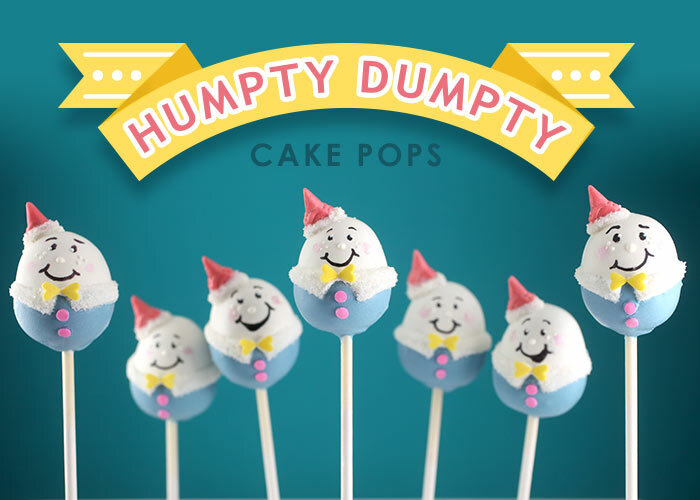 Or if you want to make pops for Easter, you can totally do that, too. 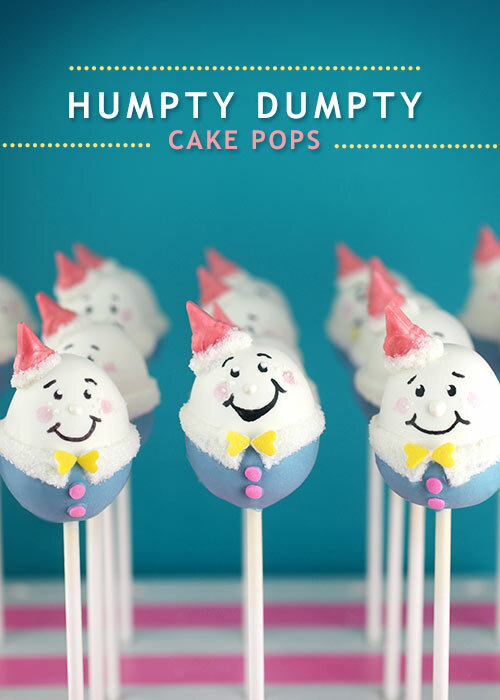 Take a look at this post for some easy Easter Egg Cake Pops. Humpty is actually dipped twice. 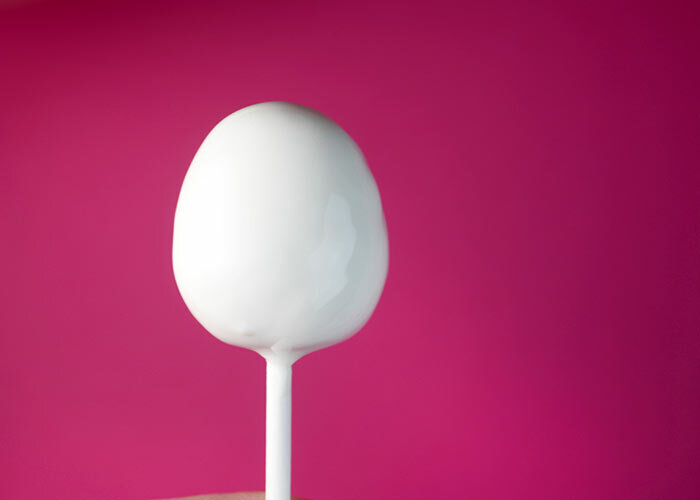 Once the white coating is dry, gently untwist the lollipop stick from the cake pop and dip the bottom of the egg shape in a second color of melted candy coating. 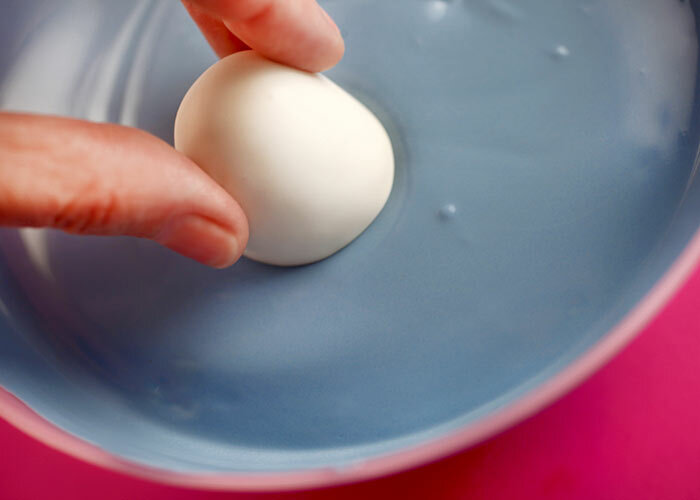 Just hold the egg shape and submerge the bottom half in coating. Remove, shake off any excess and place the lollipop stick back in the bottom of the egg. To help Humpty get dressed, fix his collar. 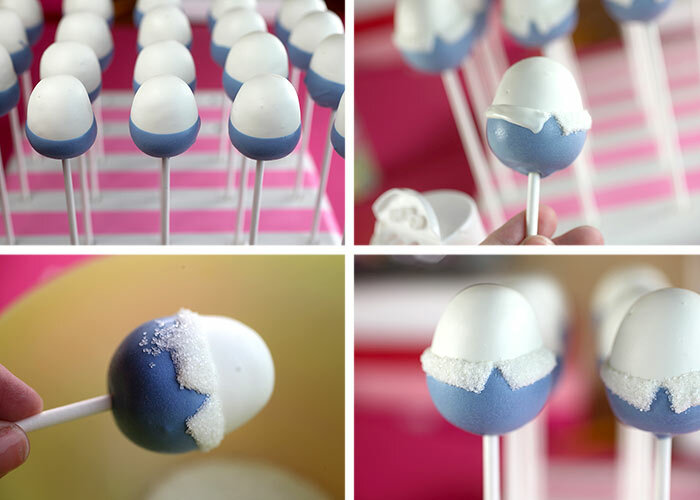 Use a toothpick dipped in melted white candy coating and draw a collar shape around the blue coating. Do one side at a time and sprinkle white sanding sugar on top. Then use the side of a clean toothpick to help straighten the edges while the coating is still wet. 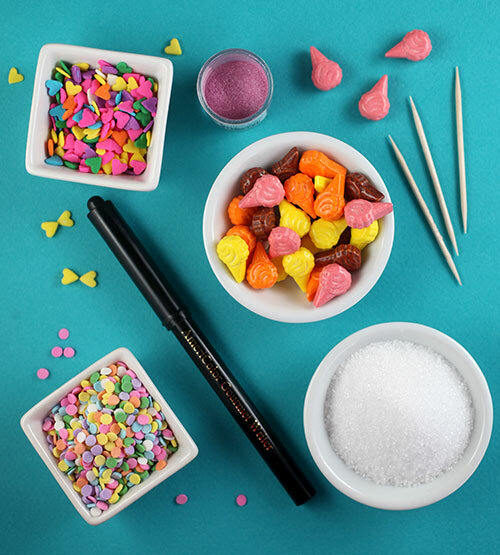 Dot on white candy coating for noses using the end of a toothpick and draw on sweet happy faces with a black edible ink pen. Finish decorating his outfit with a few more sprinkles to dress him up. Humpty needs party clothes you know. 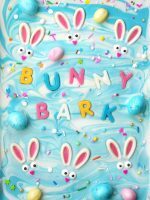 I used the same ice cream cone candies I used for the bunny cake pops last week. This time I used some kitchen scissors to cut off part of the round end. 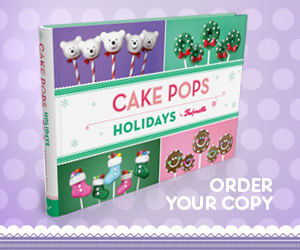 That makes it easier for the cone shape to sit on top of the cake pop. 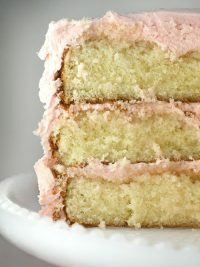 Attach it to the pop with melted candy coating and then draw on more coating around the base and sprinkle with sanding sugar to cover up any gaps where the two meet. 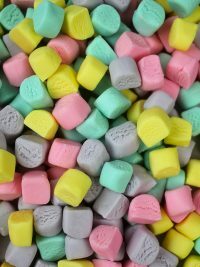 The ice cream cone candies aren’t super common. You can find them here, go without hats or find another cone or hat-shaped candy to substitute. Just get creative and have fun. Hope their happy faces make you smile. And I can’t wait till you see the Humpty Dumpty decorations from the the baby shower Julie threw. They are pretty freaking amazing! 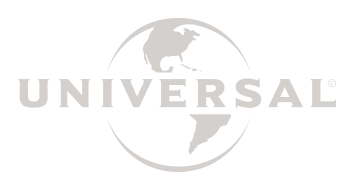 … Coming soon. P.S. Anyone have the Humpty Hump Dance song in their head right now. I do and I think it’s stuck there. The cone sprinkles again!!! <3 I think i will invest in these soon. I would die (in the best way) to go to a shower hosted by “Cupcake Julie” with cake pops by YOU! What lucky party guests! I can only imagine! Can’t wait to see the rest of the party! I’ve got “Jack and Jill” running through my head–it’s kind of the same story, isn’t it? Always love what you do, and I’m especially partial to Humpty! Cute!!! where did you get the bowl? Thanks!!! These are adorable… Can’t wait to try them out myself!!! Their little faces have personalities, they look like a somebody – sooo cute-cute-cute I’m so laughing!!! I know I end up saying the same thing each time, but seriously these are the cutest pops ever! Thanks so much for sharing. 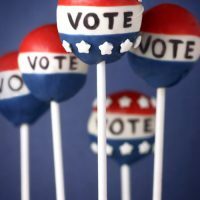 I never quite got the cake pops thing, but you make some of the cutest / amazing cake pops I have ever seen. You may have converted me and I might even try and make some myself! Hello from the UK! 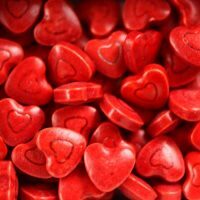 Lovely blog, these are so cute! You have got to be kidding me. These are SO cute! Too cute. Would be really cute for a baby shower. 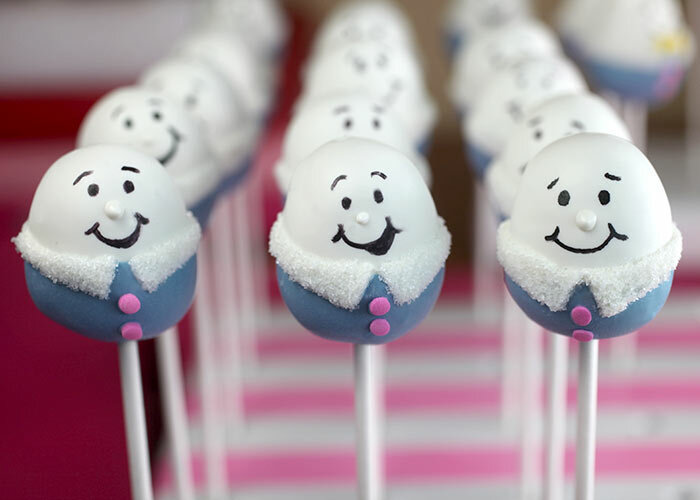 I love this eggs cake pops!!! Love their hats – those ice cream cone sprinkles are so versatile! Those are adorable. Who knew eggs could have so much personality. heeeey one of the first twenty comments! yaaaaaaaaaaaaay! Oh my goodness, Angie! So cute, cute, cute. Did I say they were cute? They are. Cute. These guys make me smile – I LOVE them! So darling! They made me smile! I adore your phantasy and your steady hand! These might be my favorites that you’ve ever made. They are perfect for a baby shower. I can’t wait to see the pictures. You are so creative. These are works of art, and so adorable! These are the cutest! You’re a stinking genius! Sooo cute … love the expressions on the face! Love em they are soooo CuTe!!!! Goof job!! I will try to do them but I’ll prollly need a whole day the first time to get them right! Lol!! These are just too precious!! I’m dying from cuteness overload here! I Love Humpty!! These look amazing!! I love Humpty, and these are cute. Big fan of finding creative uses for sprinkles, and those heart bowties are perfect! Any child refusing to eat these because ‘they’re not actually Easter themed’ deserves to have all sugar and sweet things taken forcibly from them. Or adult, for that matter. 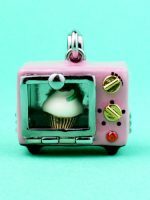 OK basically, how do you NOT have an Etsy shop selling non-edible, lasting versions of your culinary creations? I bet if you could find candy corn in a single color that you could use it as a hat too! Angie, I don’t know what to say! Everyone have already spoken! CUTE, GORGEOUS, BEAUTIFUL, OUT OF SIGHT girlfriend!!! These are amazing! 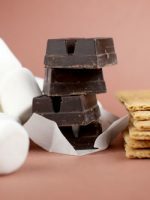 I am going to make these this weekend with the kiddos for our Easter dessert!! I just love your creativity! Thank you for always sharing with us! Wow these are amazing! (But I say that whenever I read your blog). 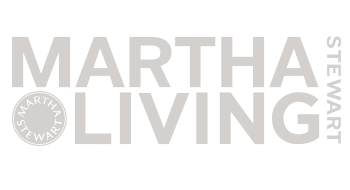 I love looking at your blog because I luurrve cooking (and eating!). Have you ever read “A splash of vanilla”? 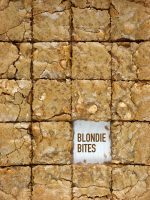 It’s another cooking blog I like to read. Still not as fun as yours though! 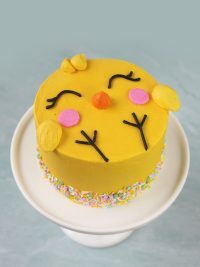 I think I’ll make a lot of happy making this recipe for Easter ..
Love love love, they are adorable ….. My Americolor black pens don’t write as well. Do you have any tips for me, so I may get that perfect look on my popos? Soooo cute and adorable! Why couldn’t they have cake pops when I was growing up?!! Oh well, at least I can enjoy them now, as a grown up. You are so creative! They definitely made me smile. They are darling, and perfectly done!  Your blog is such an inspiration! I love all your characters. My roommate and I made the chicks this weekend. So cute. Do you have any recommendations on keeping the candy coating from cracking? That seems to be one of our biggest problems we’ve faced. 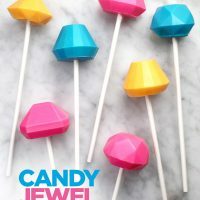 Fabulous what you can do with candy melts, toothpicks, cone-shaped candies, sanding sugar…and YOUR amazing decorating skills!!! EGGcellent!  Loved all the party craft details……the the HD Pops are FAB! 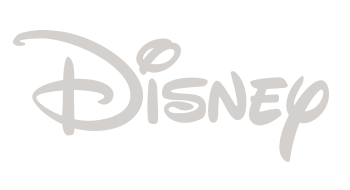 Angie – your blog is SO much fun to read! XOXO for all your hard work and inspiration! your new banner for the reynolds products won’t go away once it fully loads, making it impossible to navigate your website through the tabs in the upper left corner. Those are adorable!! 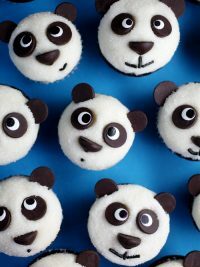 Too cute to eat!! I love all of the decorations too!! Whenever I attempt to make cake pops I end up with such a mess. The cake pop falls apart when I dip it. What am I doing wrong? Help! I consider myself a pretty good baker and cook but this has me just stumped! HELP! Do you have to coat a cake pop with anything, can you just drizzle something on top and serve???? 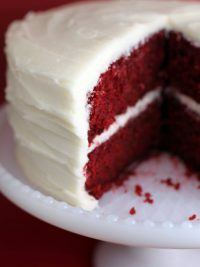 I am new to your site Bakerella. OMG too cute!! They look so intricate but you break it down into such easy steps. 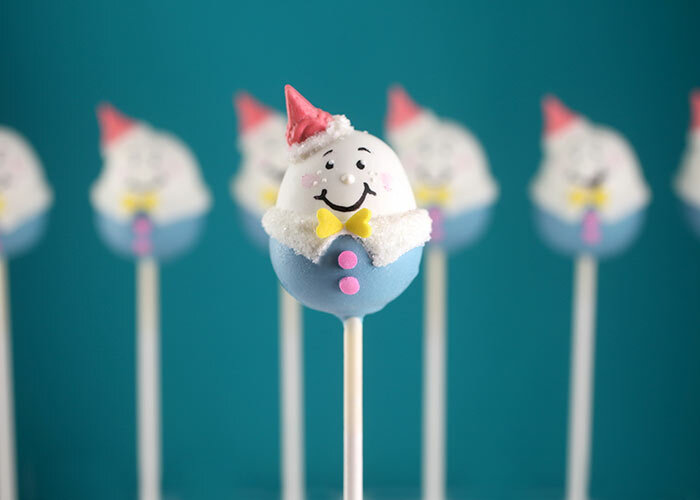 I usually make plain pops with some decorations because I am not artistic. But even I think I can do this!!! Many thanks. BTW what camera do you use?? Your pics are amazing! Oh those are so sweet! 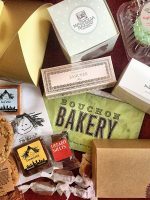 Tinker’s Bakery specializes in sweet treats perfect for everyone and baked in a peanut free environment, so all of my customers can safely enjoy anything on my menu. I specialize in bites/pops & even cupcakes. I don’t do the cake bites/pops with frosting. I create mine differently. My goal someday is to have my own bakery. Please “like” & share me. http://www.facebook.com/TinkersBakery. 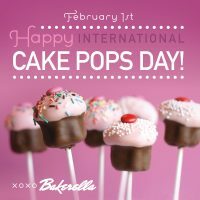 Hi Bakerella, My name is Ludy Forero, I am from Colombia, I am so happy for find this page about cakepops, all you make is really beautifull.thank for show us all your delicius. What kind of dip do you use ? We loved you creations you are so talented and inspiring that we are going to mention you on our blog in India ! Keep up the great work. Super cute! I made these for my sons preschool class for nursery rhyme week and they turned out really cue. The only problem I had is I put them in the fridge to store and when I took them out the next morning the edible pen was funny from the chocolate “sweating” tips on how to not have that? 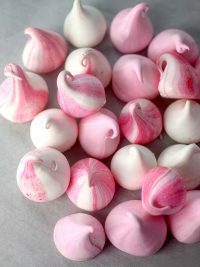 Or you just cant refrigerate them and decorate the day of? Everything looks awesome!! Are you selling any of the items I’m doing the same theme for a baby shower..